A car rental office in downtown large city wanted to increase business. The distributor chose to purchase Atalante™ style #630 - a leather tether for keys. It keeps them from getting lost or misplaced. Atalante™ printed the company's logo, address and phone number on the strap. An employee went through all the neighboring high rise office buildings in a six block radius, going floor to floor and office to office, talking with all the secretaries and giving them this present. They also told the secretaries why it is useful, a couple of ways to use it, and, "If you need a rental car for someone here in your office, our name is Rent a Car, we're only a few blocks away and our phone number is on the leather key tether I just gave you." It took about three months to give out 3000 imprinted leather key tethers. Rental Sales increased steadily and after a year sales had doubled (same month year prior). 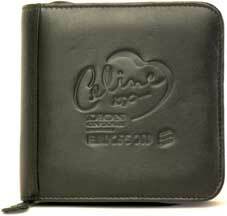 Singer Celine Dion thanked hundreds of people for their suppor by sending them a zippered leather CD case (Atalante™ style 315) for music on the road. Bag and Baggage is a retail store whose owner wants to get as much mileage as possible for his expenditures on advertising and promotion to generate business. The owner, Carmin, has found that giving away leather key fobs with his name, his business name, address and telephone number to customers is extremely cost effective. At first Carmen wanted the lowest possible price and was willing to take assorted tans and light browns and ordered 3000 at a time, spaced out over three months. Now, he is concerned with legibility of all of this detailed information and has chosen to pay a premium to obtain consistent top grade German vegetable tanned cowhide, the same leather used on the trim and handles of genuine LV bags.